I keep running into to trouble with the Crossover Lace, so I think I need to give it some time and space. Really - it's not you, it's me. We just need a little break. So, this one goes to the WIP/frog pond for a while, to see if we're really meant to be. The lace pattern is nice, but it's definitely hard to see, and the instructions aren't very helpful when decreasing. Here's a close-up of the unblocked lace. Because every 5 year old needs a glow in the dark sweater. Don't you agree? This was the first sweater he liked on Ravelry (a nipperknits pattern), so I started modeling this one after that. It really wasn't that hard. 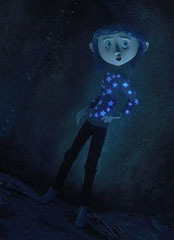 He had already decided a plain blue sweater with a V-neck was what the blue yarn wanted to be, so I'm just going to add the stars that glow. Unfortunately, I don't think I can find any glow-in-the-dark fabric, so I'm going to improvise. It will also allow me to turn this plain blue sweater with stars back into a plain blue sweater if asked (because no one is THAT consistent to always want to wear glow-in-the-dark stars). It's actually a sweater for me (shock and surprise!). The picture doesn't capture the yummy raspberry color of this yarn. It's Spud and Chloe sweater, and I think the shade is Popsicle. I bought it a while back, and just never got around to knitting it. I did have more done, but I found a place where I forgot to increase, and although I tried to save it, it was no use. So, I had to start all over again, but this time I think it's even better - more even stitches, all the increases worked in the right places, and smaller stitch markers. Today is going to be an odd day for me: I have some sort of sinus thing that won't go away. Everyone else's has vanished, but mine. Mine's hanging out, making friends, unpacking its luggage and putting it away, and that's just not cool. Fortunately, I have a doctor's appointment this morning, and maybe they can figure out why my head is a troublemaker. We'll see what the doctor prescribes, but I'm thinking an afternoon nap and some serious knitting time could make me feel a LOT better. What do you think? Every 5-year-old?! I have that sweater in my queue and I'm 26! :) I've been really picky and basically want a replica of the movie sweater, though, and haven't been able to find either blue glow-in-the-dark yarn (there is green, though!) or blue sparkly yarn that I like. :) I can't wait to see it finished! Love the idea of the sweater and also love that yummy spud and chloe yarn! @Passionate Design - I plan on passing the sweater down from one to the next, thinking that by the time the oldest outgrows it, he'll have his attentions on another sweater. I hope! @Ness - I love some of the projects people have already done of the sweater - looking through it made me want one as well. I just haven't looked for nice sparkly yarn yet. Cause every girl needs some sparkle in her wardrobe!